A few bows I have made. 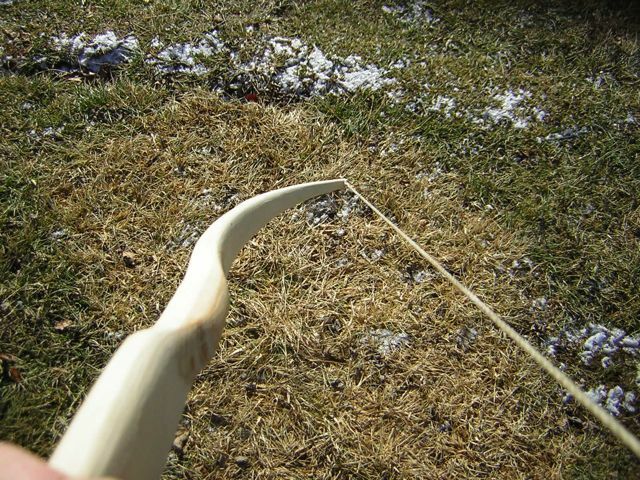 Here’s a link to an older post on making a bow. Its always difficult to stop long enough to actually take a photo while working. Osage orange shallow-D longbow. Finished Christmas 2009. I loved this bow very much. Sold it for gas money a few years ago! 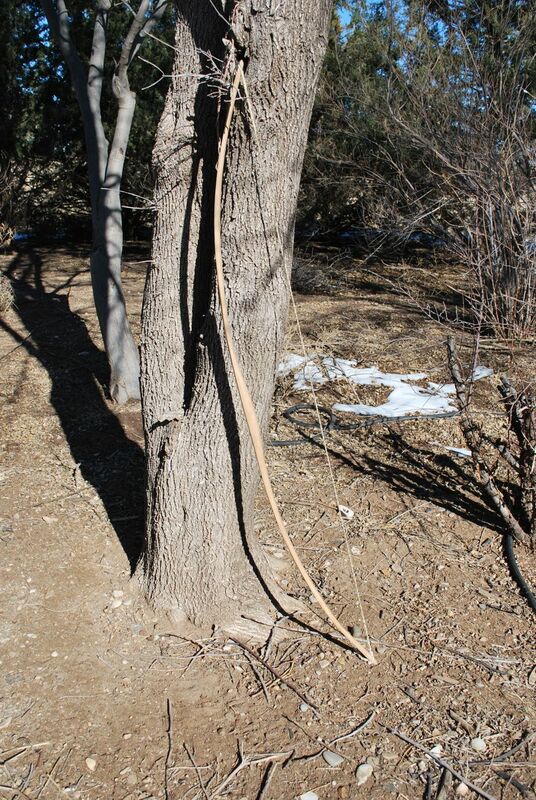 A kid’s bow made from heartwood of Juniperus virginiana (Eastern Red Cedar) backed with Carya ovata (Shagbark Hickory). A fast little shooter. A satisfying moment of eying the tiller and knowing it is “perfect”. 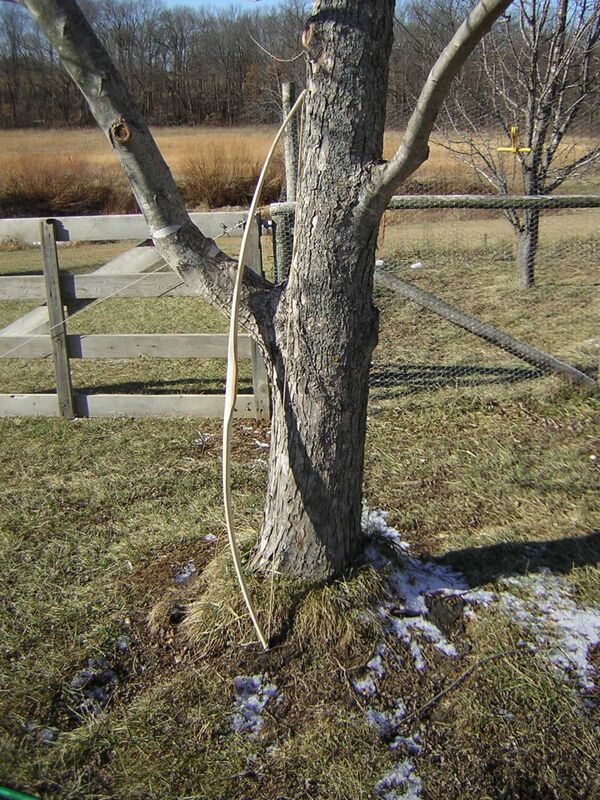 A nice, moderate strength hickory bow. 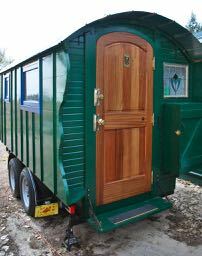 Sold immediately. Over about 5 years of shooting, this Osage orange bow settled into this somewhat ugly tiller, bending too much low in the limbs. I think it was a very good arc initially and became a little concerned when this happened. As this bow turns 10 years old this year and I still regularly shoot it, I guess it is fine. 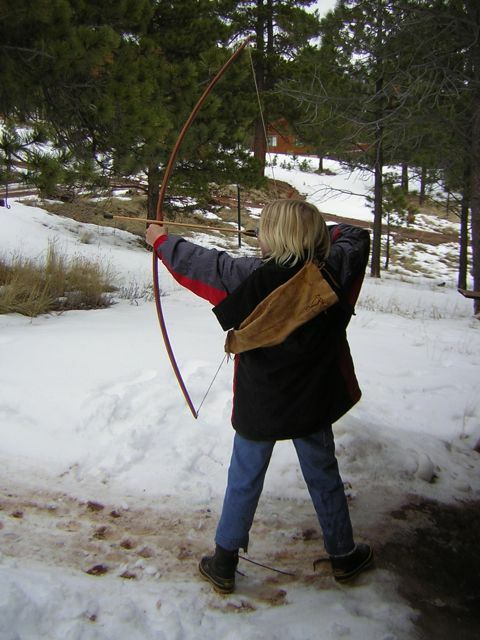 This is josh from your bow making class at winter count. I’m having a hard time finding the barbours shomaker flax. i went to panhandle leather’s website and they don’t seem to have it on their site. I think I’ll have to call them. but it seems to come in various plies and weights (like no. 18/3 etc.) what size is the stuff you recommend? Here’s what I’ve been using for a while. It is “Barbour’s Pure Flax Sinew, 5 cord left for lock stitch machines” for what it’s worth. Looking into it just now makes me think I need to research this more. Looking through some old articles this morning shows that (I think) 5 cord linen should have a little over 30# of breaking strength. Nine strands (the minimum I use for myself) should be a little over 270# in strength and twelve strands will be about 360#. The twelves are great hunting strings but you make me realize that I haven’t been very scientific about this. Hope this helps and I promise to look into strings more now that I’m curious. If you want to contact me off the comment list my general email is: “zcoyotez (at) yahoo (dot) com”. Good luck. It was a lot of fun working with you over the week. UPDATE: Maurice Taylor in the 1940 Bowman Review notes Linen 40/3, 30/3, 10 cord, and 12 cord being used for bowstrings. He noted 40/3 linen apparently common as it is a tightly spun thread used for button thread. The tighter spun thread was believed to prevent fraying. Cool factoid. I was wondering what dimensions do you use in producing such fine looking bows . 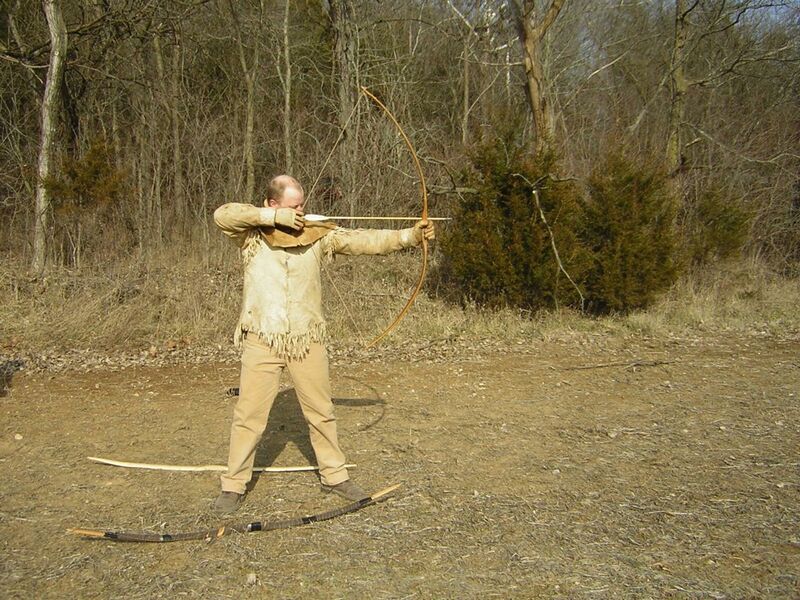 I wish to create a well balanced 72″60# long bow of Osage orange . If you would kindly share these measurements with me I’d be very greatful. 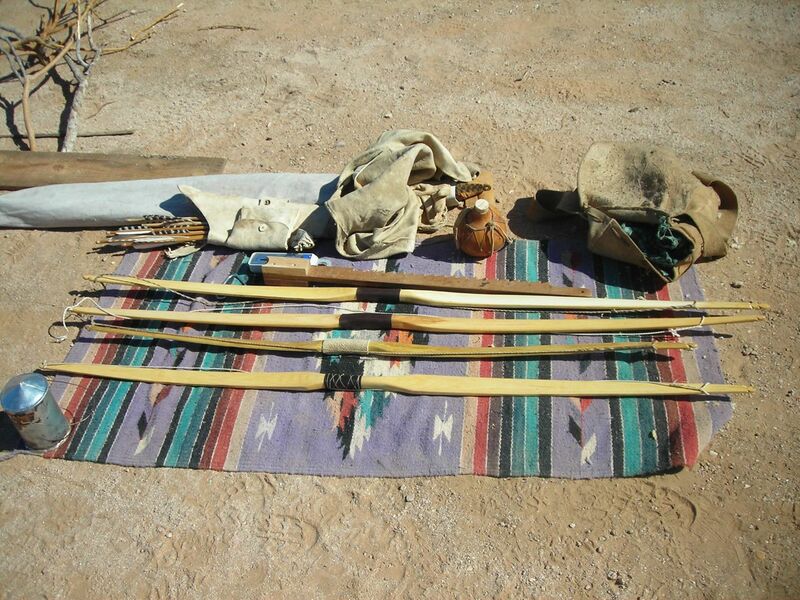 I build bows myself but I seem to be missing that final knowledge , if you know what I mean , I had no teacher I’ve just been doing what felt right . 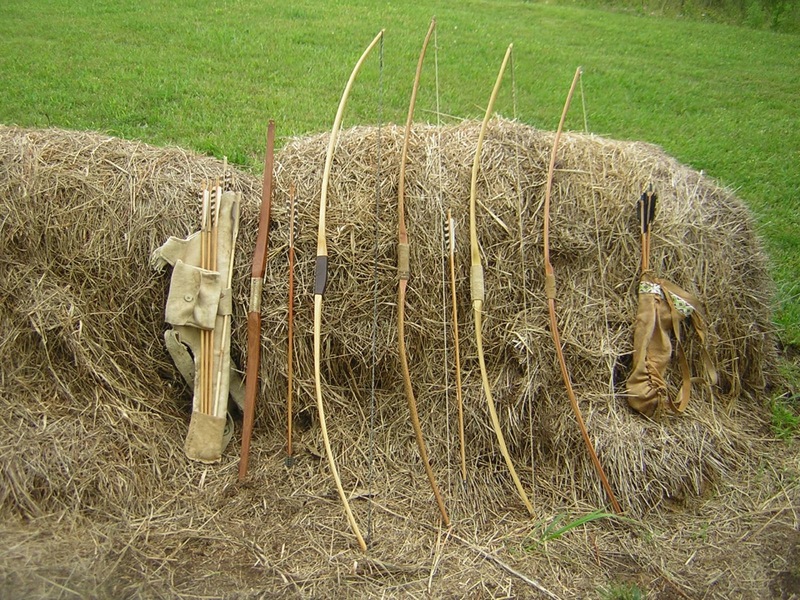 my bows are fast and hard shooting . 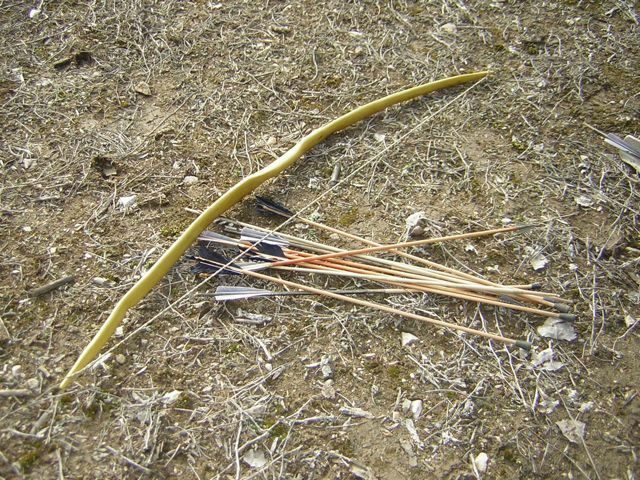 I’d like to step up my game and figure out How to craft a reflex deflex bow that wouldn’t rip my arm off on release of the arrow. Osage orange is a lot more variable than hickory so every dimension is really just a guide. Twists, kinks, and knots play a part so the Osage orange bows I’ve made vary a bit more in length and shape. If were making a “one off” to your 72″ x 60# goal and had the perfect stave in hand my layout would be: 4″ for the grip, each limb tapering out 5″ to about 1 1/2″ wide limb, staying parallel sided for about 2″, then taper down to the tips at about 3/8″-1/2″ wide. As for thickness on Osage I start at about 5/8″ near the base of each limb and tiller down to about 3/8″ or a little less out at the tips. I hope this gets you started. I keep a notebook these days with some general layout dimensions of what has worked in the past for different styles and woods. It really helps me to have some numbers to refer to when laying out and roughing into shape.